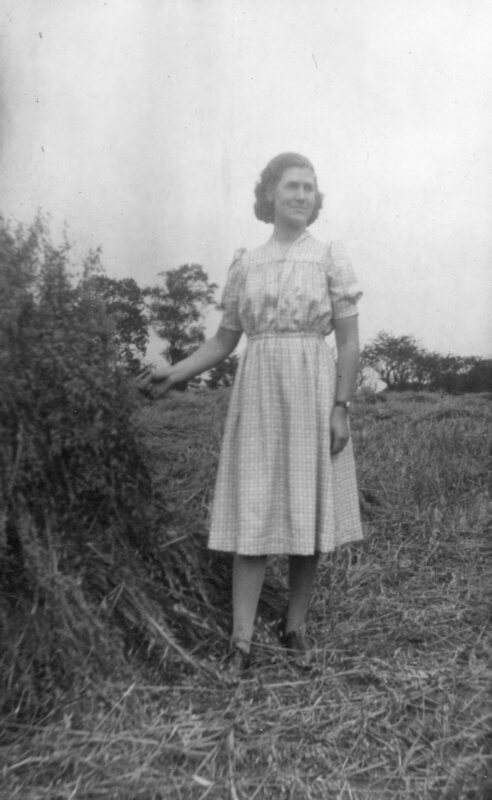 Elsie Okell was the daughter of Elsie Okell and the late Percy Okell of Liverpool Road Farm. Percy was a farmer from Great Barrow, Cheshire, born in 1885. He had two brothers, James and Lewis and a sister, Sarah. He went to Canada more than once to farm and had an accident whilst there when he was run over by a cart. He returned in 1910 and he married Elsie Toft at St. Matthew’s in 1913. By this time Percy was recorded in the banns as “of this parish” and Elsie as a “spinster of Barrow parish”. Percy died from a stroke on June 20th 1921 possibly brought on by his injuries sustained in Canada. 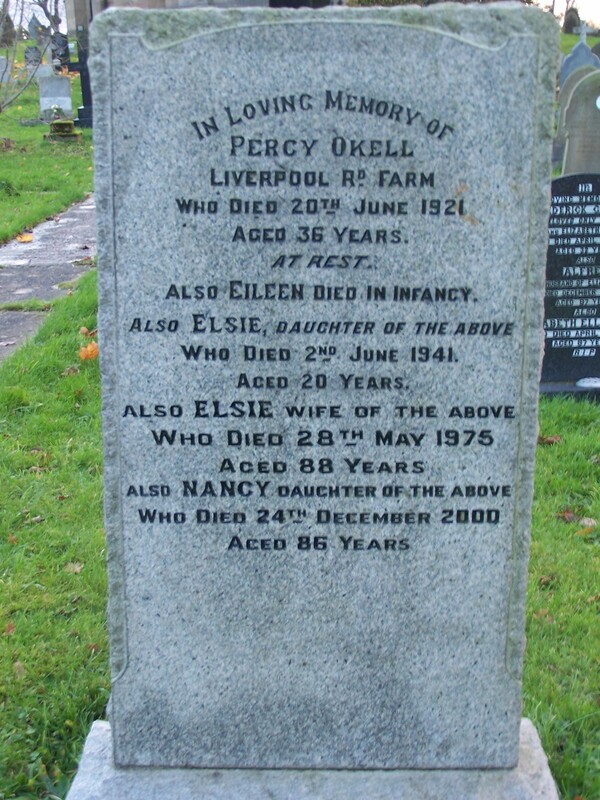 Percy and Elsie had five children, Nancy, Eileen (who died aged 5 days), Eric, Mary and Elsie who was born in 1921 just one or two months before her father died. When Percy died the elder Elsie was left with the farm and four children under seven. 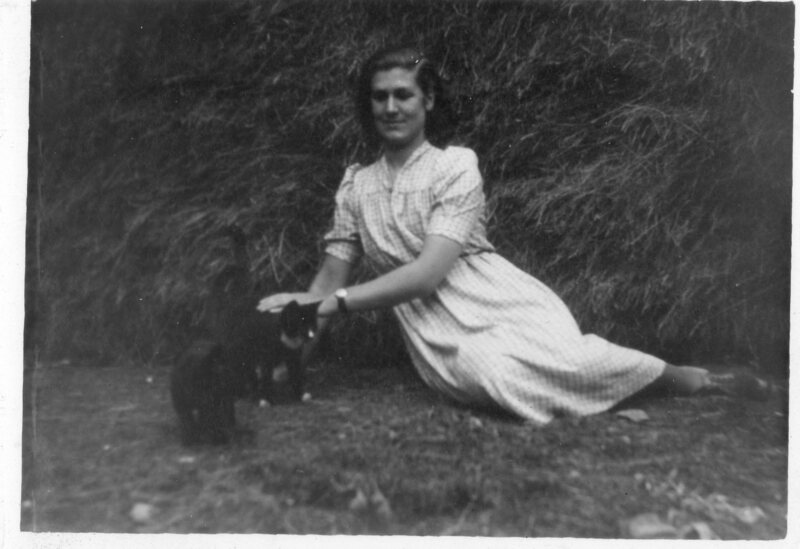 The younger Elsie attended St Matthew’s Infants and then Hawarden County Grammar School. She trained as a nurse possibly at Dobshill locally and at Heswall where Percy’s brother James was farming. 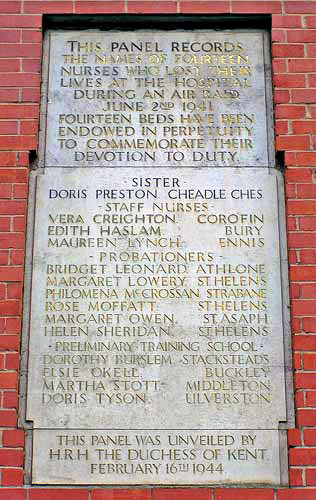 Elsie was one of 13 nurses and a nursing sister killed when a German bomb hit the Salford Royal Hospital on 2nd June 1941. Elsie was one of four probationary nurses who were working their first day at Salford. She died only 3 days after a German bomber had crashed at her farm (as reported in the Buckley Magazine, 20.21.23.28.29). The hospital site in Salford has been redeveloped but a memorial stone tablet commemorating the nurses remains above the original Chapel Street entrance. Elsie is also remembered on the family grave at St. Matthew’s with her father, mother and sister Nancy. 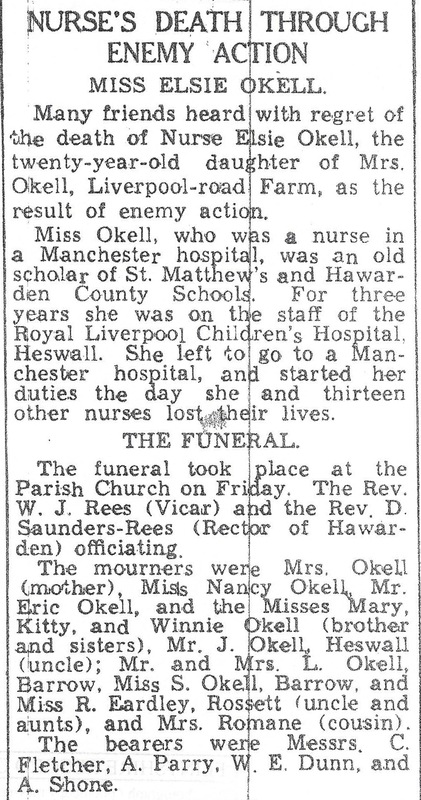 Mrs. Okell died in 1975 aged 88. After she retired from the farm she lived at 53 Liverpool Road next door to Alice Wilson, the mother of Newton Wilson who was also killed in e War . Elsie and Alice were born 4 years apart. In their lives they each lost an infant child, each lost a husband following an accident and was widowed for over 50 years, and each lost a son or daughter in the War. Elsie senior and Nancy saw Alice regularly each week for a chat and were good neighbours. The author acknowledges the contributions from Gareth Okell and Philip Lansdale (nephews of Elsie Okell) and Ian Wilson (nephew of Newton Wilson) plus assistance from the Buckley Society, especially Carol Shone, Barbara Forbes, Paul Davies and Graham Caldwell. Photos courtesy Gareth Okell and Buckley Society.